1 of 4 Bring a large pot of lightly salted water to a boil. Heat oven to 350 degrees . 2 of 4 Add rigatoni to boiling water and cook al dente, as per package directions, about 14 minutes. Add peppers during last 2 minutes. Drain and return to pot. 3 of 4 Stir in meatballs, marinara sauce and shredded cheese. Transfer to a greased 2 1/2-quart baking dish. 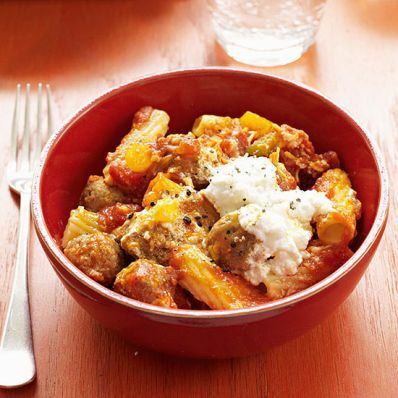 Top with spoonfuls of ricotta. 4 of 4 Carefully cover with foil and bake at 350 degrees for 25 minutes. Uncover and continue to bake for an additional 20 minutes or until bubbly. Stir gently before serving.